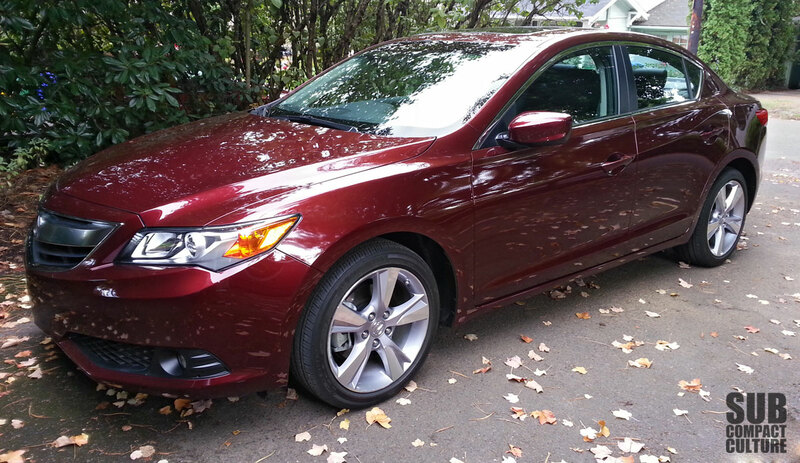 In the driveway this week is Acura's compact 2014 ILX Premium sedan. Powered by the same 2.4-liter engine that powers the scrappy Honda Civic Si as well as a precise six-speed manual, the ILX is a more comfortable overall package, albeit, not quite as sporty. After my drive to work today, I noticed the ride is certainly smoother but the handling isn't quite as racy. Also, the ILX does not have the limited-slip differential like the Civic Si, so you'll have one wheel spinning through harder corners. It is, however, very well appointed inside, it has a great stereo, and that Crimson Garnet paint is gorgeous. I happen to think the ILX looks great and is more attractive than the it's Civic cousin. Losing the limited-slip is a big minus in snow country too. Especially since you can get an Si from the factory with summer tires, and maybe try to get a deal on the steelies and snows.